Dr. Parks - Congratulations on your retirement. What a fantastic farewell concert by the Wind Ensemble. 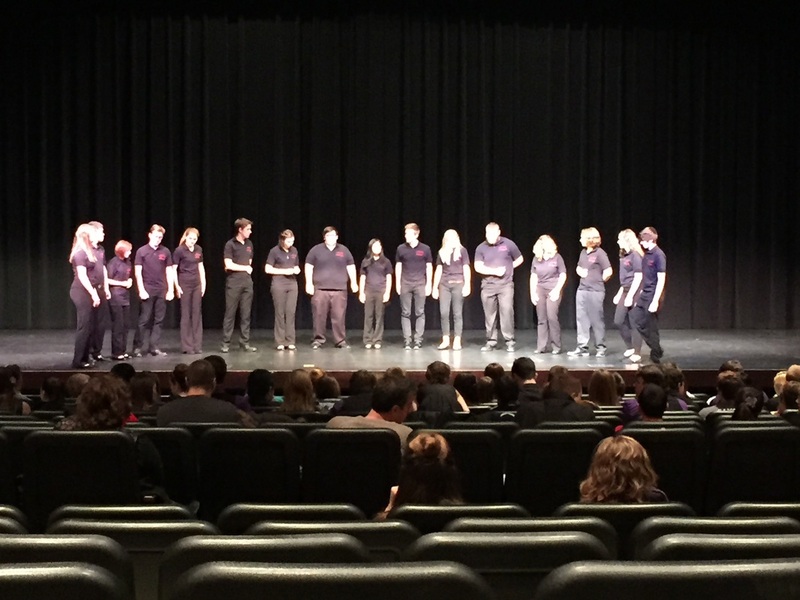 On Thursday night, 34 students traveled to Bloomington Center for the Performing Arts to see the internationally acclaimed group called The King's Singers. They were joined by the Illinois Wesleyan University Collegiate Choir and together premiered a new composition by Philip Lawson. (Lawson then joined them on stage!!) Following the concert, we got to meet each member of The King's Singers, as well as Philip Lawson, to get pictures and autographs. What an incredible night of entertainment!! Happy Valentine's Day and congratulations to the Vocal Jazz groups (Red & White) on their FIRST performance of the National Anthem. What a great way to start off the semester!! Congratulations also goes out to the MTHS Boys Basketball team for pulling out a WIN tonight against Bloomington. 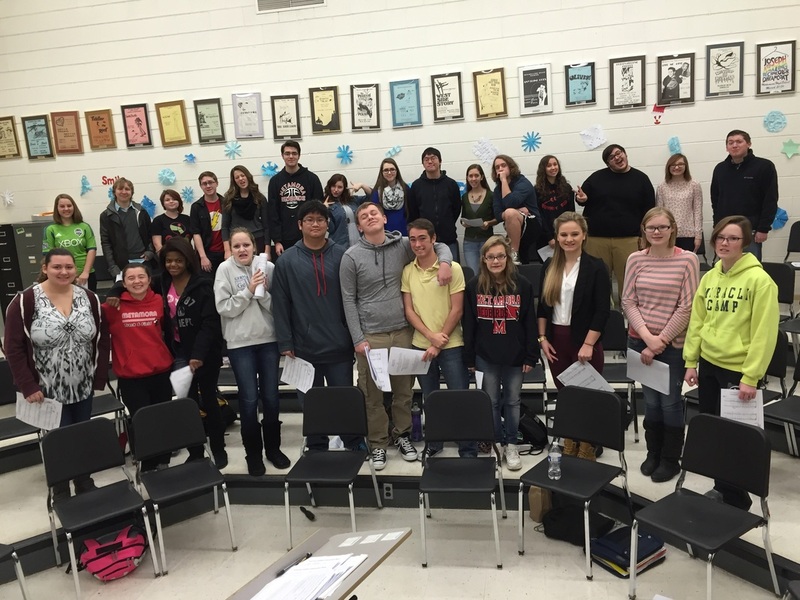 This week, the choir has been hard at work participating in the 1st annual "Give Back Week." This is a week that was created to encourage choir students (and all students) to give back to their friends, school, and community. Each day they were given an assignment and were asked to write a letter or create a card for someone else. MTHS had the great pleasure of hosting this year's Mid-Illini Choir Festival on Monday, February 9, 2015. Each of the Mid-Illini conference schools brought their top choir to share a great night of music and entertainment! We also honored Mr. Pete Driscoll as he retires at the conclusion of this school year. Best of luck, Pete! Schools that attended were: Canton High School, Dunlap High School, East Peoria Community High School, Limestone Community High School, Morton High School, Metamora Township High School, Pekin High School, and Washington Community High School. Congratulations to all schools involved! Fantastic job!! Congratulations to the following students on being selected for the All-State and Honors Ensembles at the ILMEA 2015 Conference. What a great representation of MTHS talent! Congratulations to all of the members of the new 2015 Vocal Jazz Ensembles at MTHS. The MTHS Madrigal Singers participated this year in the 2014 Mid-Illini Madrigal Sing hosted by Washington Community High School. We had a great time and the students sounded great! It was also great to hear Washington, Canton, Dunlap, Limestone, and Morton!! Congratulations to everyone and best of luck at your dinners. Congratulations to the 5 students from Metamora that participated in the district 3 senior chorus festival! On Saturday, students arrived on the Illinois State University campus for a day of rehearsal. Mr. Bob Boyd was the Senior Chorus Director. Together they made some incredible music and had a day full of learning and growth. They were accompanied by Ms. Kathi Best. Congratulations to all members involved in this great festival. You made us very proud and represented Metamora in such a great way!! The Madrigal Singers were asked to perform for the Metamora Grade School PTO Family Fun Night on Saturday, November 15th as a part of the Medieval Theme Book Fair. We had a great time and the students sang GREAT! On Friday, September 26th, students from our Madrigal Singers, Court Singers, and Madrigal Acting groups creatively designed a Madrigal themed float for the 2014 Homecoming Parade. Thank you to the many students that participated in this event, parents that donated time and resources, and the many volunteers who helped to make this a fun afternoon! Students of the Madrigal Singers and Court Singers ensembles gathered for a night of team building and fun.